Getting a waffle maker has been oh-so-much-fun; it's definitely brought my weekend breakfast/brunch game up a notch! As you might know from my posts, I've tried out quite a few waffle recipes so far but the possibilities seem endless. 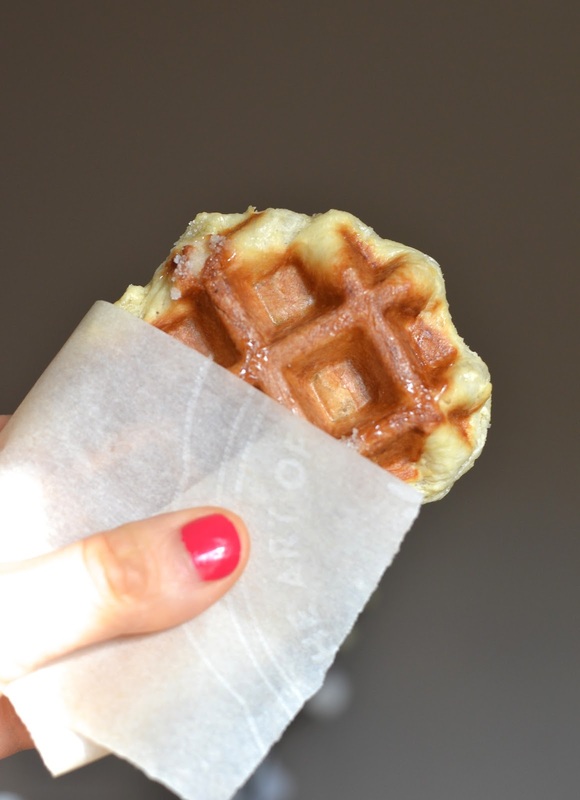 This time, let's talk about a very different type of waffle, the liège waffle. Belgium is one of those fantasy places I'd love to visit. There's the chocolate, of course, and then there are the waffles! From what I've read, there are two types of waffles in Belgium: Brussels style, that's a deep-pocketed yeast leavened batter waffle, and liège waffles, which is also a yeast batter but different in that it's richer, sweeter, and denser. Liège waffles are essentially made with brioche dough that's embedded and studded with chunks of pearl sugar. As this sugar-crusted dough cooks in the waffle maker, the pearl sugar melts and caramelizes to create a glossy sheen and a slightly crunchy exterior that gives way to rich, buttery, stringy brioche softness within. Once you eat it, you'll remember it. For whatever reason - possibly because it's not as easy to find just anywhere - I've always wanted to make liège waffles. In fact, I bought special Belgian pearl sugar (more on this later...) just for the job even before I got my waffle maker! It never hurts to be prepared. Liège waffles are so rich and flavorful (think warm, eggy, buttery brioche with extra pockets of sweetness) that you don't really need anything to go with them. But sometimes it's not just about need. I plated some of mine with fresh strawberries, a little chocolate sauce, and threw in a little whipped cream (all of which I had in my refrigerator, though maybe not quite incidentally) and it made for an excellent brunch plate. However you choose to enjoy it it, it is a special waffle to savor on occasion. You know...I never considered myself a huge fan of brioche, in part because it wasn't a type of bread I ate much growing up, but I am definitely awakening to the beauty of it. It is surely something special in waffle form! Belgian pearl sugar. These are the large chunks of sugar used for liège waffles (don't confuse them with the smaller grained Swedish pearl sugar - the ones used on chouquettes). I think it's pretty important to get your hands on this if you're going to the effort of making liège waffles. If you really do need to DIY it, one viable suggestion I've heard from David Lebovitz is to chop up some sugar cubes. Not surprisingly, I made half the recipe. Aside from it being a more manageable amount for my family, I remember how jarring it can be to make brioche dough (the stand mixer tends to rock) and I thought a smaller quantity might be a safer bet for me. It was very manageable. Making brioche dough requires just a little patience. Butter needs to be worked in, bit by bit, so you end up with a nice stretchy dough. Since we're working with yeast, the dough needs time to rise - first for about 2 hours and then overnight. So plan ahead and start a day early. When you're ready to make the waffles, add the pearl sugar and knead it into the dough. It will look like a lot of sugar but that's how it's intended to be. Then, divide the dough into small rounds to cook individually. I get 8 with half a recipe. I was a little concerned about the process of cooking these waffles and wondering if they might burn on my waffle maker. There's no temperature gauge on my waffle maker and I'd read that you shouldn't cook these above 370 degrees, or the sugar will burn. I set my waffle maker on the "3" setting (about medium in terms of how dark I want them to turn out) and had no problems. Cleanup just took a little patience and warm water. I don't have removable plates so cleaning isn't quite so convenient but it wasn't a major issue beyond requiring a bit more work. It was really nice to see my mini pile of glossy liège waffles. They smell amazing and taste so rich, buttery, and sweet. It's absolutely tender and soft in the center - a real treat! These waffles are great dressed up and eaten with fruit and chocolate sauce (of course) but you know how I like them best of all? I love just eating them by hand, ripping it apart, and tasting it on its own in between sips of hot coffee. Make dough: Warm milk and water to about 110 to 116 degrees (I used the microwave), and place it into the bowl of a stand mixer. Add sugar and yeast, stirring to combine. Let sit for 5 minutes; the mixture should look foamy. Whisk in the eggs and vanilla, then stir in all but 1 cup of the flour (it does not have to be exact) using the dough hook of the stand mixer. Add salt and mix to combine. With the dough hook running, add butter, a spoonful (or about a tablespoon) at a time, thoroughly incorporating each addition and scraping the bowl as needed until all the butter has been mixed in. It's important to be patient with this step so that you're rewarded with a stretchy, layered dough. Add the remaining flour and knead with the dough hook for 5 minutes, or until glossy. Cook the waffles: Right before cooking, knead in the pearl sugar. It will look like a lot. Divide dough into 16 mounds. If it's hot and the dough feels greasy, keep the dough in the refrigerator as you cook in batches. Heat waffle maker (I used a Belgian waffle maker, set on "3" or medium browning). When waffle maker is ready, place a ball of dough into each pocket and cook according to manufacturers' instructions. It should take about 5 minutes and be golden brown when done. Very carefully (we're talking molten hot sugar) remove the waffle with a fork or tongs and set on a baking sheet lined with a wire rack. Keep waffles warm in a 200 degree oven before servings. Waffles need to be served warm! Otherwise, the sugar hardens and it will not be the soft, sweet, and tender waffle they are meant to be. Reheating frozen waffles: If you freeze any leftovers, place frozen waffles on a wire rack-lined baking sheet and reheat them in a 275 degree oven for approximately 8 minutes, or until warmed through. Once fully heated through, serve immediately or keep them in a 200 degree oven to stay warm. Now I really consider to get a waffle maker! These look scrumptious! It is a fun little tool to have! Monica I had no idea such a kind of sugar even exists!! Those waffles look so good! Tell me about it! It's not easy to find...I heard Ikea once sold it but online is best bet. I've never made liège waffles but man they look good! And I've never even heard of that sugar before! My waffle maker also doesn't have the removable plates - it's something I always say I'll think about next time I buy one (which won't be for a very long time haha). Hope you had a great weekend Monica! It's so rich and flavorful...just a special thing to have once in a while, you know. I really wanted a deep Belgian waffle maker and didn't notice ones with removable plates. Oh well...it works just fine so far! You're so sweet, Medha. I used to take a lot of process pictures but stopped when it got to be a little too much about that and not enough enjoying the cooking/baking process. I'm glad if the couple of background pics helped though. Thanks! These waffles look just lovely, Monica! Its my dream to own a waffle maker! I know I know, that is a very achievable dream but then I think only my daughter is going to eat these. These liège waffles are so interesting...I have never had anything like it...they sure look delicious, super rich...indeed they make a great brunch. I think you'd like it, being a fan of brioche and breads? The sun is shining here and it's a beautiful week. Hope the same is true for you. These waffles look fantastic, Monica. And addition of Belgian pearl sugar makes them more intriguing! That sugar just caramelizes and it's key. A treat for sure. Your waffles look perfect! Instead of soup for lunch you make me want to grab my waffle maker and get cooking! Thanks for this "going to make soon" weekend recipe! Hi Pamela - same here...I keep thinking we're going to have waffles for dinner one night this week! Enjoy this awesome weather! These look incredible, Monica! I love all the waffle recipes you are sharing - I've never tried liege waffles before. I am completely smitten with how fluffy and thick these are! The pearl sugar sounds amazing too! Hi Kelly! They are so different from regular waffles. I guess it's just like having brioche super caramelized and with a unique texture. It's kind of crazy using all that sugar in here but it works. : ) Hope you're having a great week. Hi Monica, I received a waffle maker for Christmas and only made waffles once, mine were only crispy on one side, love that the sugar crisps up the waffle will be trying this. I love a solid crisp on the outside/soft on the inside waffle. These are totally different and good in its own way...probably more of an occasional treat but I have wanted to try it for so long. Hope you put your waffle maker to use soon! WOW! This sounds amazingly delicious Monica :-) This sugar is something new to me. Thank you for such a lovely share. Oh Wow Monica! What a chef you are... Each time I was in Brussels I had their wonderful waffles... yours looks pretty much the same. You really should visit this city you will ADORE (you can find tons of tips in my little corner). Have a lovely day and thanks for sharing. No chef here but I love learning something new and realizing we can all make these things at home with pretty good results. : ) I will definitely check out your Brussels tips. I would love, love, love to go one day. Thanks! Sitting in an airport looking at these and I want them so bad!! Oh no you have just convinced me to add waffle machine to my wishlist! These waffles look so delicious! I am fascinated by this recipe! I've never heard of them but they sound perfect. I absolutely love the fact that they include yeast. Thank you so much for sharing this recipe - I've gotta try it! These look SO good! Something I have never made at home and I really should do! It's so fun to make it happen at home. Thanks, Caroline! Oh I love love the kind of waffles which includes yeast. They are the best. You really are such a great cook. They look fluffy and perfect. Great one my friend. Yes, things with yeast have so much flavor and the texture is also a whole different story. It has been a beautiful week here, very warm! Loving it! Hope you are doing great! Wow! What a treat, it looks like your liege waffles turned out great! I love the way you describe the brioche dough studded with pearl sugar. What a mouth-watering treat!